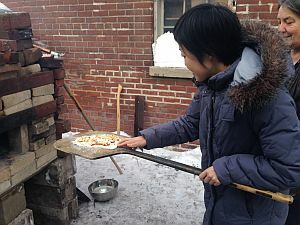 Although we first found out about temporary ovens through Bread and Puppet Theatre, and we CELOS workers built them ourselves in various parks, we thought they were mainly a fire platform for pizza. Then in 2015 we visited Alan Carlisle's community garden oven. 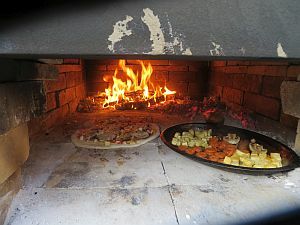 The garden may soon be replaced by condos, so the gardeners could not build a permanent, mortared oven. It happened that the garden is located behind a former factory and there were piles of firebricks left behind, as well as other useful stuff. So Alan built an oven, entirely with materials he found. 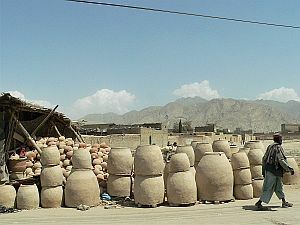 When we saw the ingenious way this temporary oven had been built, we realized that more was possible than what we had been doing with temporary ovens. 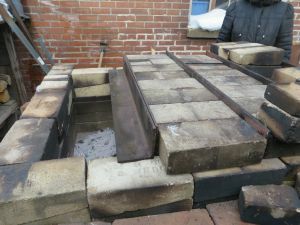 We wanted to explore the question: In order to cook good food, does a wood-fired oven have to cost a lot and be built by specialized tradespeople, with expensive materials? What if we went to the opposite extreme, copying Alan Carlisle, and tried making a really cheap oven with scrounged materials? What's more, what if we built it without construction experts -- with park bakers rather than professional contractors? It would need steadiness and imagination, so we asked former park baker Yo Utano to come back to Toronto to help. Yo has an ongoing project of chronicling the skills of old people on several remote Japanese islands -- people who still know how to supply their wants in the traditional, often non-monetized ways. So we knew Yo would not shy away from building and cooking in a cheap, simple oven. 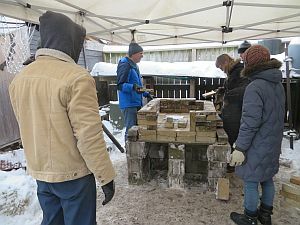 Notes on collecting the materials: Before Yo came, we gathered bricks from various sources (including from Alan), retrieved some old angle iron, brought home some discarded plywood from Dufferin Grove Park, and sorted everything into piles in the part of the backyard that we called our "winter oven lab." The only cost was $17 for a cement board to put on top of the plywood under the hearth. Notes on building version one of the oven, Dec.17 2016: We gathered a small group of people to help build. We got unexpected but very welcome help from Dale Howey, the main bread baker at the Montgomery's Inn oven. It took us four hours on a snowy December morning. We tried out the oven the next day but realized in a few days that the roof was too high. 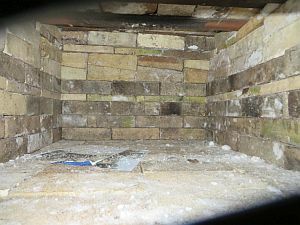 Notes on modifying the oven, Dec.23, 2016: we took off four layers of bricks down to the angle-iron crossbeams and rebuilt the oven lower. 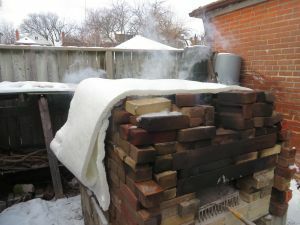 Notes on new insulation and the first good firing (Dec.30, 2016): We wanted the oven to keep its heat better, and we had read about ceramic fibre blankets, so we bought one, from a place in Mississauga. The third firing got the oven up to 500F, and the food we made was better. 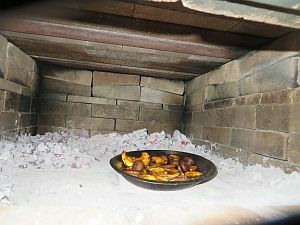 Notes on making more kinds of food, adding the tandoor (Jan.3, 2017): This was the day we brought the tandoor into the oven lab, and used it in sequence or simultaneously with the oven. 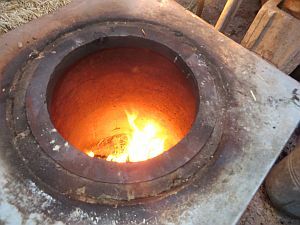 The tandoor doesn't qualify as scrounged material, but it was kind of an orphan. 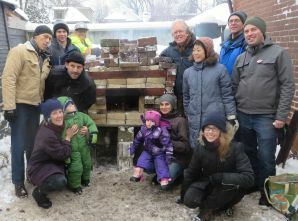 In 2011, David Rothberg had donated $700 to buy a small, portable tandoor in Little India on Gerrard Street, so that the Thorncliffe Park Women's Committee could use it at their Friday Night Bazaar during the two years it took to negotiate with the city for permission to have a permanent park tandoor. 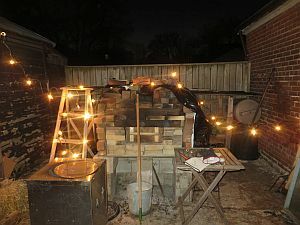 Afterwards, our little tandoor was taken to a few places, but it didn't get enough use for any of us to learn how it could be integrated into food-making in the same way as the Dufferin Grove ovens were integrated. That's why it now joins the oven lab. Notes on oven lab housekeeping. A place to log our experiences with the cooking equipment. Frederik van Oudenhaven and Jamila Haider, With Our Own Hands: the gripping story of their five-year project documenting community and the commons in the Pamir Mountains of Afghanistan and Tajikistan. Frederik studied in Toronto, was introduced to us by Yo, and came to visit in early December 2016, before we began our project. 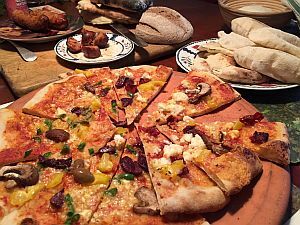 Richard Miscovich, From the Wood-Fired Oven, recommended by our baker friend Carole Ferrari. This was our main book of reference and reminder during the three weeks Yo was here. Kiko Denzer's blog. The blog links stories from all sorts of bakers and builders. Kiko has been our pen pal for a few years, and sent some advice for our temporary oven before we started: "try to keep the highest point of the dome to about 16" (6 - 8 courses of brick, depending on thickness)." We ignored his advice on Dec.17, so then on Dec.23 we had to rebuild the top of the oven the way Kiko said. The good thing is that if you ignore good advice, you often get another chance: you can learn from your own mistakes.